I’ve recently taken up running as a hobby (I’ve always been fairly active, cycling quite a bit, but have never been a runner) and decided I’d like to run a half marathon this year. While I’m still early in my training all this running has had some effects, both good and bad on my beer drinking. When my iPhone GPS app tells me I’ve burnt 800 calories on a run I take that as a free pass to drink an extra beer (or three). But it also means that after a long day at work when I want to crack open a beer I just can’t bring myself to drinking a big high ABV beer (which often come in 22oz bottles) because I know what that will do to my morale when the alarm goes off at 6am and it’s time to go out for a run. 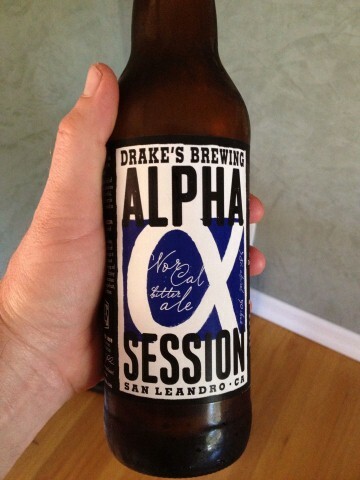 Thus, I’ve gotten a lot more interested in “session beers”. While some beer geeks could argue about exactly what makes up a session beer for hours, I roughly define them as beers under 5% ABV, the word “session” comes into play because one could drink a handful of pints over a few hours during a “drinking session” and due to the low ABV still be able to walk out of the bar without being too drunk. So it was one night after work, knowing I had to get up early, face the cold morning and go for a jog that I passed over the bottle of Pliny the Elder in the fridge for Stone Brewing Co.’s Levitation Ale. Levitation is a 4.4% ABV amber or red ale that I’ve had a handful of times in the past, but often pass up in favor of something with just a bit more kick. Levitation Ale took the GABF Gold for American Style Amber/Red Ale in 2007 while competing against 67 other beers, which is an impressive feat considering many of those other beers were higher ABV so in some senses the brewers had more to work with. I’ll just come right out and say I wasn’t too impressed with Levitation Ale. It wasn’t a bad beer, I just kept thinking of all the beers I’d enjoy more, sitting mere feet away in the refrigerator. (That said I was thanking myself in the morning when I got up before the sun that I didn’t drink any of those other beers, many of which are twice as strong as Levitation). It’s got a toasty and earthy smell, a little sweet and a little hoppy that prepares you well for what’s in store. The taste is similar, it’s sweet malts up front think bread and toast as well as a bit more sweetness like caramel. Then the hop bitterness kicks in. This is actually where I was most disappointed, the finish was bitter as hell, with almost no hop flavor. There weren’t any of those delicious pine, citrus, tropical fruit or floral flavors so often tasted in a beer, just plenty of bitterness. I will say that Levitation Ale had a great body and mouthfeel for being such a low ABV beer. It never felt thin or watery, and had I not known it was 4.4% ABV I doubt I would have guessed it was that low. Levitation Ale does serve a purpose, it’s great those for those times when for whatever reason you can’t drink higher ABV craft beer (and you certainly wouldn’t be caught dead with a Bud Light) but compared to other craft beers it just doesn’t stand up. All things being equal though, it’s a fantastic sub 4.5% ABV beer. Levitation Ale is pretty widely available around San Diego County (and other places you can find Stone’s beer). I picked this single 12oz bottle up at Bottlecraft for $1.55, usually it’s sold in 12oz 6-packs.